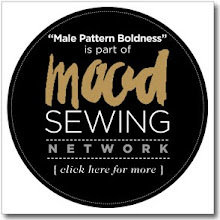 male pattern boldness: How Do You Feel About Polka Dots? How Do You Feel About Polka Dots? Friends, I generally avoid polka dots. I find them hard to look at, especially if they're evenly spaced. But even if they aren't (George Clooney, up top), they can overwhelm. I've sewn only a few polka dotted projects with mixed results. I liked this polka dotted shirt I made a number of years ago (below). Thankfully the dots were teeny, which helped, but it still photographs funny. This week I decided to give polka dots another try. 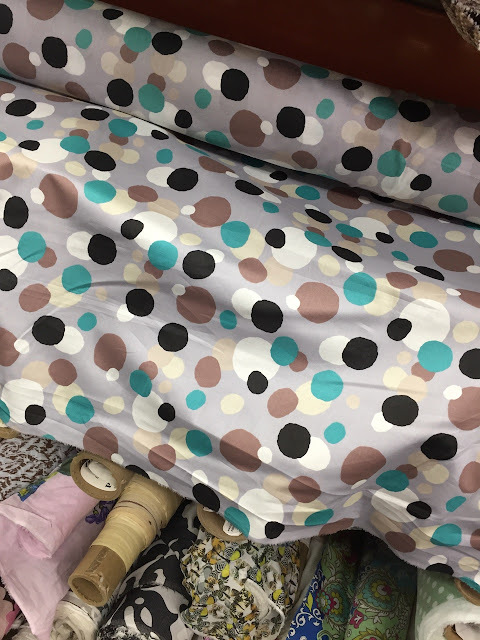 I found a silky cotton polka dot print at Mood in a palette I loved -- very Fifties retro, don't you think? It reminds me of formica countertops. The uneven dots and the mix of colors make it easier on the eyes, imo. 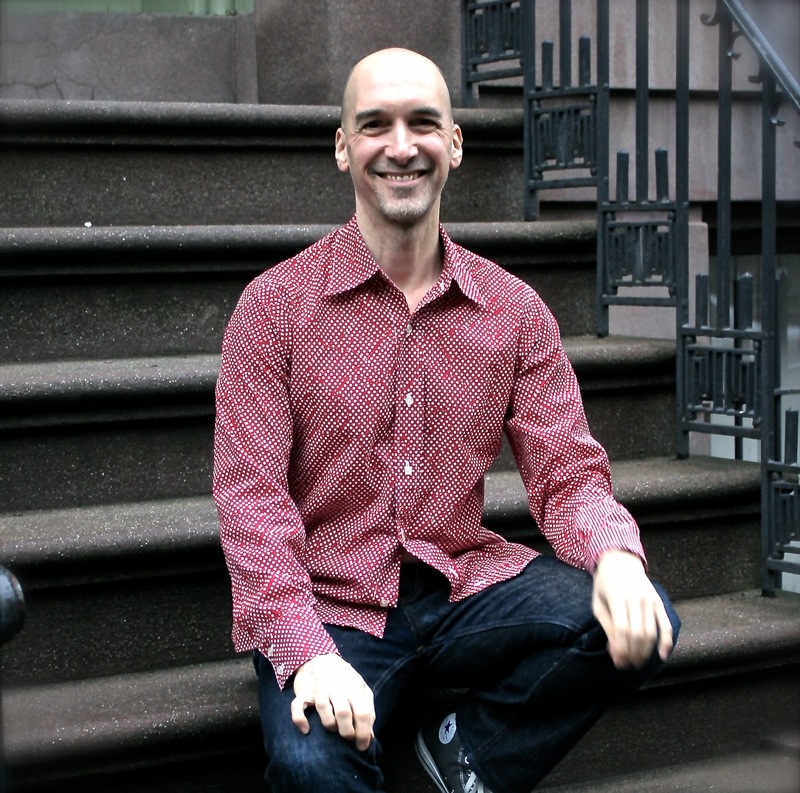 I thought it would make a great short-sleeve convertible-collar shirt for an upcoming warm-weather vacation. 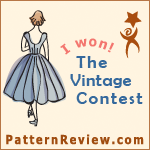 I used a favorite pattern, McCall's 3995, which dates from the late Fifties. Here are some progress shots: it's almost finished. The back has a center pleat. Instead of interfacing my shirt facings the usual way, I used a technique called "facing the facings." 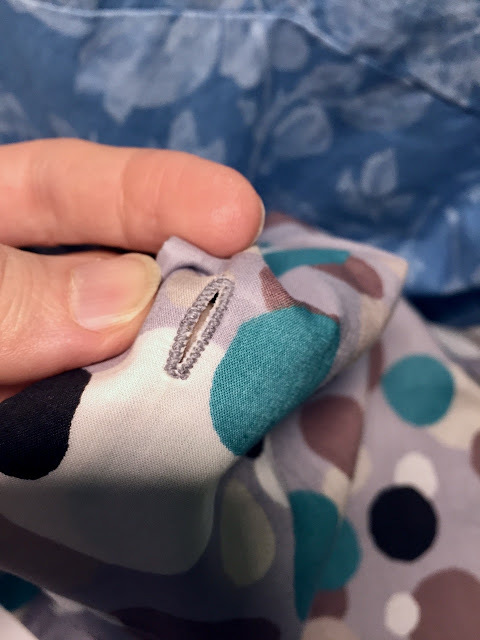 I stitched my interfacing to the edge of my facings, right sides together, folded the interfacing over the edge and then fused it to my facing with my iron, leaving roughly 1/8" of fabric at the inside edge. The result is a nice clean finish that doesn't require serging the edge or folding the raw edge under and stitching, which can look bulky. Here's what it looks like with the facing folded into place. I made my buttonholes with my vintage Singer buttonholer (model 121795 -- easy to find on eBay). Here's a short video of the process. Naturally, I reinforce my buttonholes with Fray Check. Did you know Fray Check is actually liquid nylon? Below, you can see me topstitching the cuffs of my sleeves. I've been making this shirt on my Singer 15-91, which I've been using for nearly all my sewing projects these days, along with my Bernina 930. Nothing wrong with my other machines, but these two have been operating flawlessly. The 15-91 is one of my earliest vintage straight stitcher acquisitions. 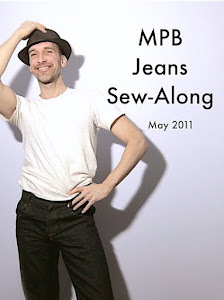 As soon as the shirt is finished, I'll show it to you -- hopefully this week. In closing, are you a polka-dot person or do you generally avoid them (as I used to). Why are they so hard to look at? 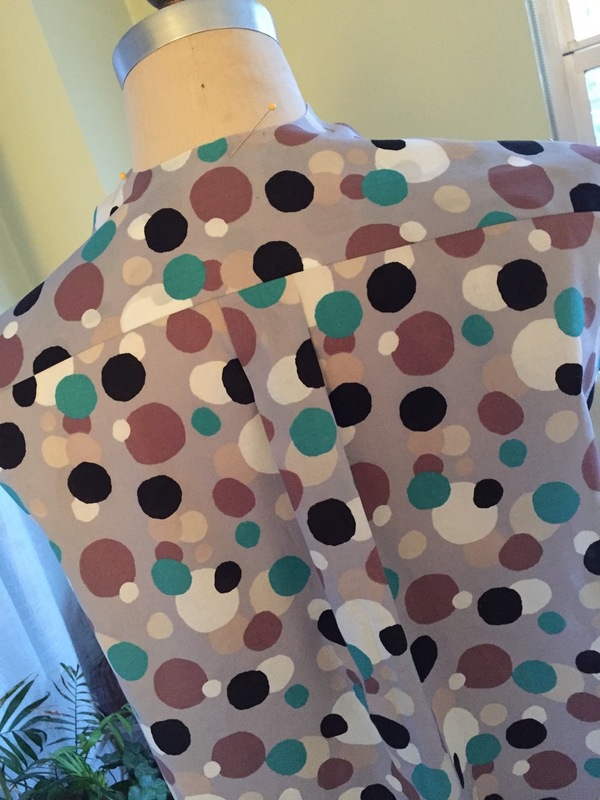 The "Polka Dot Polka" -- must be seen to be believed! 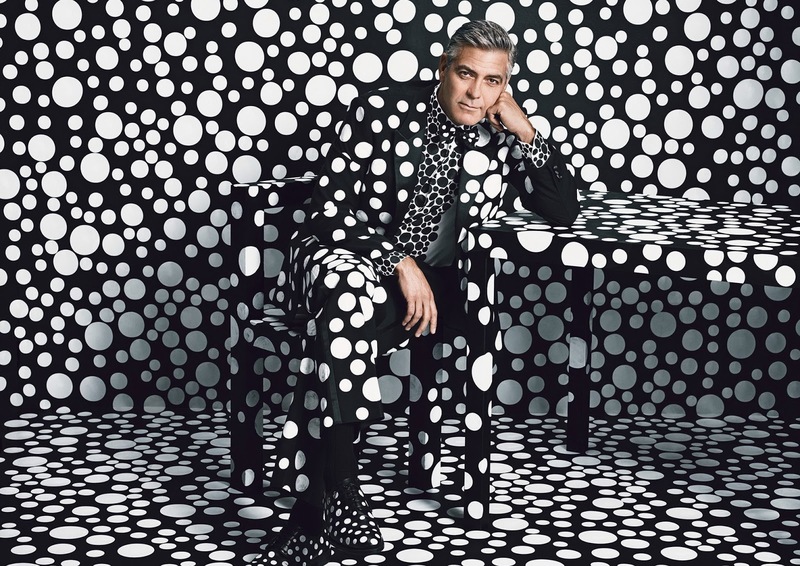 george clooney can make anything look good -- but i think i'd still give his suit a shot. and i am really liking your choice of fabric for your shirt, too -- i think it's going to look great! Your shirt is looking good and I love your facing technique. Thanks for the great Polka-Dot Polka. And your shirt looks great, wish I could sew like that! I like very much your palette choice. May be I would have prefer a black collar ? Not sure. 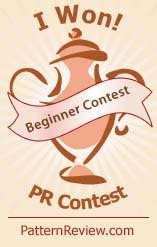 Thanks to share the interfacing interesting method. One question : if no mistake, this technic needs to interface the whole front pieces or just the borders ? This is just to interface the facings, which fold back at the edges of the shirt fronts. I really like your fabric choice for your shirt. I also want ti learn more about facing the interfacing. Interesting and I think it would be very useful. Don't remember ever thinking about polka-dots before now. Your new shirt fabric is, however, interesting and attractive. 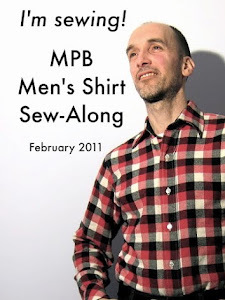 The shirt will be lovely for Spring. You have imagination as well as skill. 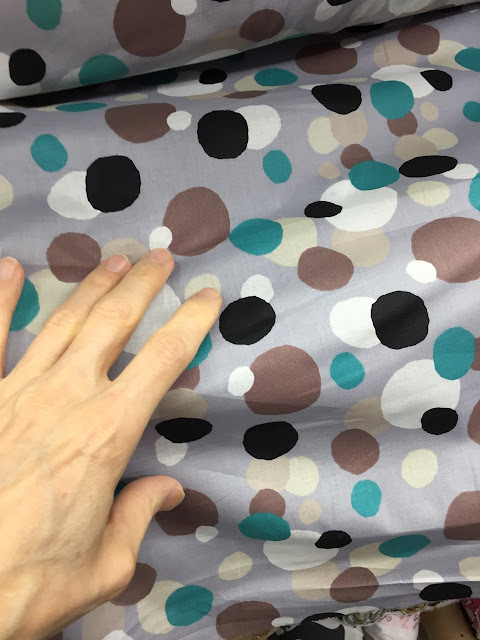 I like your fabric, but for some reason, maybe because I don't see a lot of men wearing them in real life?, it's reading as blouse or dress fabric in my mind. I'll probably change my mind when I see the finished shirt. Thanks for the tip on the interfacing the facing technique. I don't know when the last time I had polka dots in a garment. I'm fairly sure there are none in the garment fabric stash. However the quilting stash has a number of smaller polka dots. I love a polka-dot fabric, but I don't seem to wear it often. 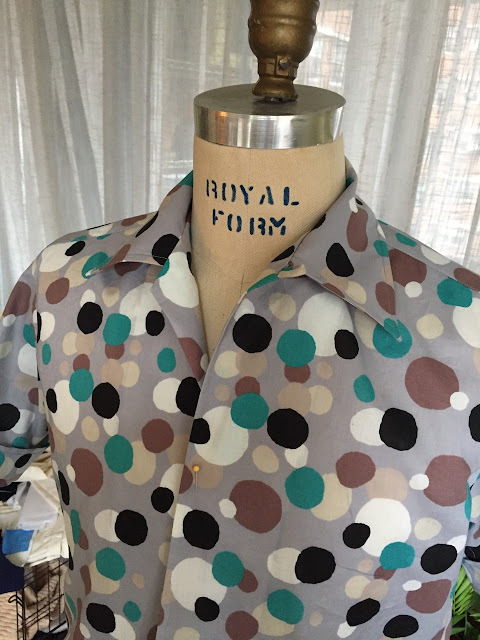 Really like the silk/cotton polka-dot fabric you've picked up for your vacation shirt. I really like the new shirt fabric. I generally like polka dots - but they are rather iffy for men's clothing. This shirt will look great with a pair of jeans, I think. Oh, I like the retro-looking fabric! It immediately made me think of a man's sports/vacation shirt from the 50s. I think the main problem with symmetric dots is: there's no place to rest the eye. Conversely, there's nothing to hold one's attention, either! In the last shot, my eye kept going to the tats for relief from the dots. Yes! What you said about symmetric dots reminded me of what my college art instructor stressed from the first day of all of his classes. Good composition must have "movement" leading the eye to a "center of attention". 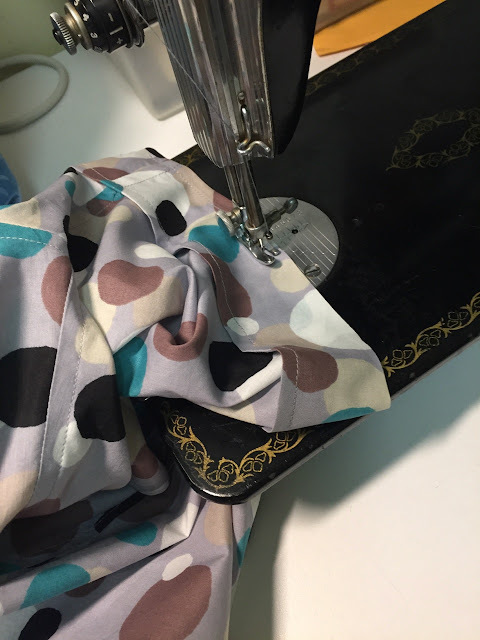 The polka dots you're sewing are sophisticated and whimsical without skewing towards Minnie Mouse. Great color harmonies too! "How do you feel about polka dots?" I lurve them. If only could wear that shirt in front of the stage curtain of my grade school's multi-purpose room. 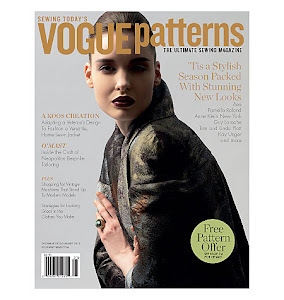 Luv the pattern, and the facings tip. For facing the facing, when you say sew the fusible to the facing RS together, the RS of the fusible is the non-glue side, yes? 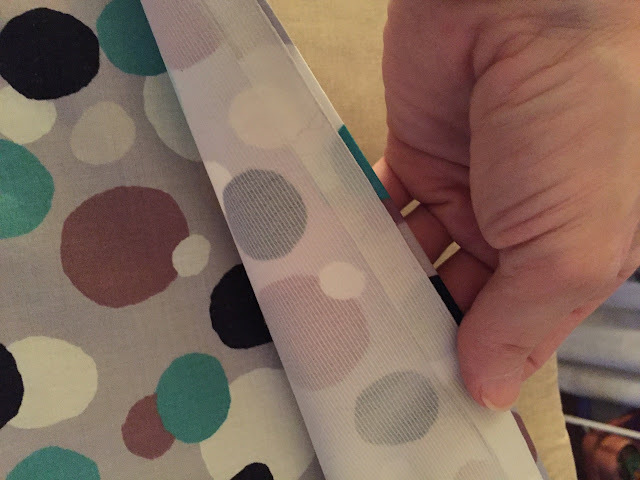 Then you fold and fuse the interfacing's glue onto the WS of the facing and end up with something conceptually akin to a French seam, only the second stage uses fusing instead of a second line of stitching, for an even cleaner look? Hm, realizing I still don't quite have the whole picture. You face the facing, and fuse the whole facing, and sew the interfaced facing to the garment in the usual way? It's a fold-back facing, so you simply fold it back at the front extension on both front pieces. Love polka dots! Especially white on black and vice versa! Polka dots are hard to look at because they are naturally an obvious diagonal print. When looking at them you see lines moving which (to the brain) is very loud. Various sized and grouped dots are not usually symmetrical and are easier on the eyes (and the brain.) It has the same properties as Tartan plaid. Very loud. That is the best explanation I've yet heard for why polka dot prints can be distractingly "loud". I don't like polka dots because they make me think of the clothes I wore as a little girl, and I'm a grown-up now. I know what you mean about polka dots. I put some larger scale polka dot knit in my cart, and out of my cart at Marcy Tilton and ultimately didn't buy it. I decided it was cool on some people but not me. this is definitely cool on you. I love the colors and yes, it does look a bit retro. I have no problem with polka dots. Try red and white houndstooth. A good friend who recently past away had a jacket of red and white hounbdstooth. Whenever she wore that jacket I had to look past her to speak with her. My eyes would water if I looked at her directly. Now I've seen it, I'm still having trouble believing it. That's some scary video. What were they high on, is the question that comes to mind! I normality agree- I don't like polka dots because they're hard to look at, but that print with the broken lines of dots is very attractive, & the colors are retrotastic! I will only wear polka dots mixed with another pattern to break up that brain scrambling effect. Your shirt does the same thing because the colors are pretty much the same value. At first I thought how did he find the polka dot polka clip, then about 1/2 way through I began to think why would have anyone ever produced this? Very funny - a must watch! I love Polka dots, I actually have a black shirt with small white polka dots which I wear with a white tie which has black polka dots, the dots are small on both however, before you all cringe! George Clooney in polka dots, mmmmmmmm yes please. 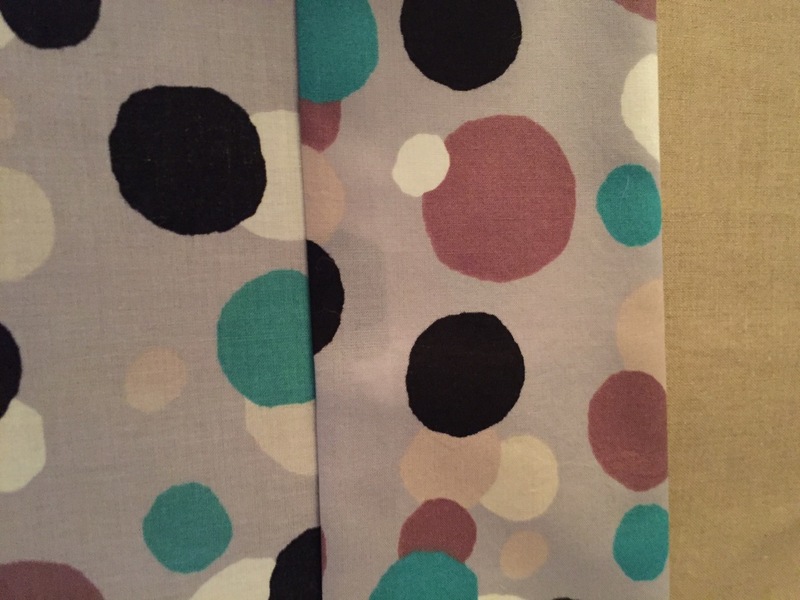 Love the fabric that you chose for your new shirt, that would look good for a 50's shirtwaister with a full skirt. Peter, I love that fabric - more like bokeh background than polka dots. The tattoos are lovely! The pink shirt - not so much. I find the small white button dots jarring, and the colour is ghastly with bond white dots. The sleeves don't sit right either... Did everybody know that you can dye shirt buttons with the 'synthetic' dyes? like Rit dye more, and Jacquard i-dye poly? just boil them up for the time to achieve the colour depth. You gotta play with the amounts. better than buttons interfering with the patterns... on that pink monstrosity, some should be pink, and some should stay white. Wedding Photos From All Three Weddings!